Greek media have revealed 13 false identities used by Admir Murataj during the period he was fugitive. According to Greek media, the 48-year-old has used identities during this time as Kristaq Murataj, Admir Murati, Kristaq Murati, Admir Murataz, Kristaq Murataz, Admir Xhaferi, Kristaq Xhaferi, Admir Nikaj, Kristaq Nikaj, Xhafer Nikaj and Kristaq Azemi. Meanwhile, another detail released by the Greek media is that the authorities there have been suspicions that Murataj is hide in Kosovo, while no link has yet been made to his activity there. Meanwhile, the investigations conducted so far have not brought any arrests, although the police and prosecution claim that they have strong evidence. Sources say a phone has been found that has been subjected to expertise. From the rebuilding of the event, it turns out that Murataj tried to burn the car with wich commited the robbery near the Tapiza Bridge in Tirana, the vehicle with the inscription "Tax Investigation", but after the police crash he was involved in a gunfight. 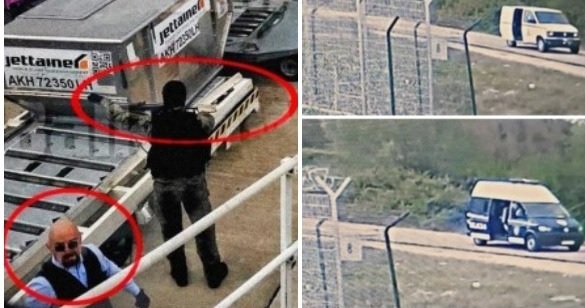 According to a report on the police announcement, it was announced that the van was at 14:57 minutes at the at the siege of Rinas Airport and at 14:59 minutes was on the runway, charging the money in the van. After the vehicle's expertise, it turned out that it was modified.